Fe, an earth-abundant and non-toxic metal, is an appealing candidate to substitute noble metals in catalysis. Fe-based NPs offer an interesting means to couple activity with high recovery potential, via magnetic separation. A major hurdle in their applicability for the industrial hydrogenation reaction resides in the high water sensitivity of this material. 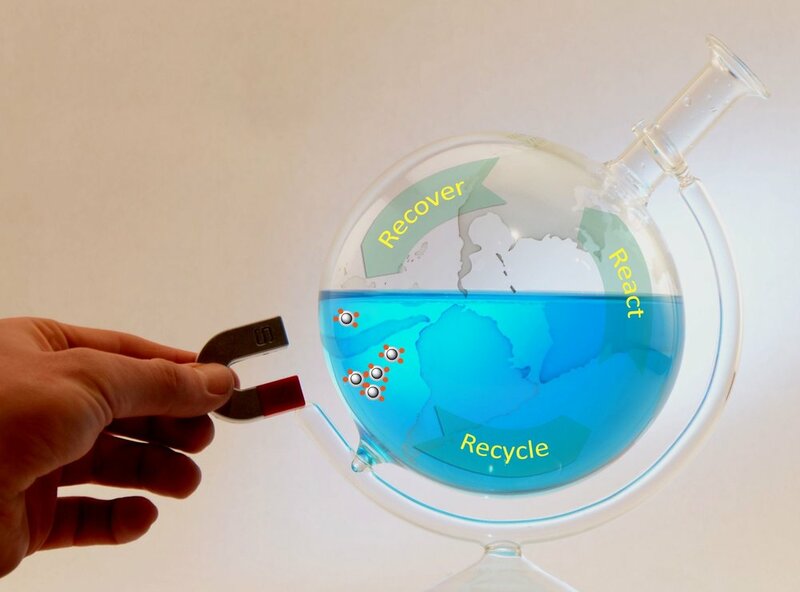 We established that iron-iron oxide core-shell NPs (Fe CSNPs) are active in the hydrogenation of olefins in ethanol and in the presence of water (Hudson, Chem. Comm. 2012). We further improved this system and showed that amphiphilic polymer-coated Fe(0) NPs could protect effectively in situ produced Fe(0) from water oxidation, while allowing a high catalytic activity in alcohol and water-rich mixtures (Hudson, Green Chem. 2013). This article led to the filing of a patent, and was covered in various general public media, including Chemistry World (RSC) and the ACCN Canadian Chemistry News. They can also be effectively applied to the generation of mixed metal nanomaterials, by using Fe NPs as seed, reducing agents, and supports. This scheme eliminates the use of wasteful reducing agents and ligands and relies on water as a benign solvent. With Cu, we generated recyclable Fe/Cu NPs, able to heterogeneously catalyze the Huisgen condensation (Hudson, Green Chem. 2012) and the cyclopropanation of alkenes (Ishikawa, Tetrahedron, 2014). Using high-end electron microscopy technique, we studied these materials and proposed a mechanism for the galvanic reduction leading to these mixed nanostructures (Masnadi, Langmuir 2015). At last, we used Fe NPs to access well-defined hollow Fe3O4 nanoshells. These proved to be highly active, selective and recyclable catalysts for the oxidation of styrene into benzaldehyde using difficult-to-activate molecular oxygen as oxidant. These nanoshells had never been studied for their intrinsic catalytic activity for oxidation and were shown to surpass the performance of known catalysts, based on noble metals (Rak, Chem. Commun. 2014). In an effort to review the field of simple magnetic NPs, we also wrote a review on this topic (Hudson, Green Chem. 2014). Nature highlighted our work on Fe in a News feature in 2016.